Please Note: All Material on this page, and in all my "History of Gear" webpages, is copyrighted, and no usage of my material is permitted unless explicit permission is granted by me, Bruce B. Johnson, owner of OregonPhotos.com. The image above was created by this photographer.... The pack fabric shown is tough and durable Cordura nylon. Story source: several conversations and a visit with company founder Don W.
Yak Works was begun by Seattle area Vietnam veteran Don Wittenberger and his cousin... Don writes about events in May of 1970, "I received a $250 cash veteran's bonus that the State of Washington gave to returning Vietnam veterans, which I used to buy some tools and materials, and that is how The Yak Works was launched. 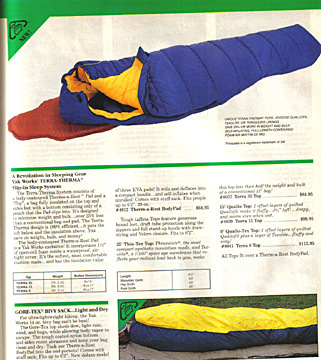 We originally called it "Wilderness Outfitters" and the first product design I worked on was a down sleeping bag." SOFT PACK INNOVATOR: In the History of Gear, the Yak Works story features a remarkable coincidence of independent invention. This was in the realm of pack design. Both famous climber Don Jensen (via Rivendell Mountain Works) and "nobody" Don Wittenberger launched their revolutionary soft pack designs within less than one year of one another circa 1971. Don writes, "The real story here is the fact that two individuals -- one a storied climber of his time (Jensen), the other a novice recreational climber and uncredentialed tinkerer (me) -- who worked independently on the same problem, came up similar solutions." Don was the primary designer for the company's early years, and decades later he is still very proud in particular of his soft pack design: "In those days, I was climbing with a packframe and a European-style climber's rucksack, both of which balanced horribly when you were trying to climb something. I was unaware of (Don) Jensen or his design at the time, and came up with the Yak Pak design from my own invention, and completed this design a couple months before I saw a Jensen Pack for the first time." 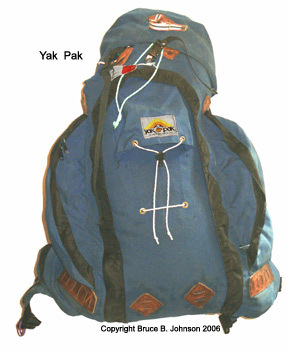 In describing the innovation involved in this pack design, Don states, "Yak Pak's most unique feature was an X-strap suspension in which the straps crossed each other across the torso and could slide. What this did was, if you reached an arm up to a climbing hold, the strap across the high shoulder could take up the slack from the strap across the low shoulder. This eliminated shoulder strap binding when you tried to move your arms, especially in upward reaching positions. Combined with the body-hugging contour design, there was very little movement of the pack during climbing movements, and if the pack was loaded properly, it didn't throw you off balance like a pack frame or conventional rucksack would. This strap suspension was my original invention and I was granted a U.S. patent on it." 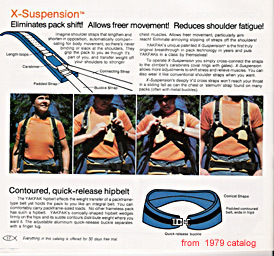 Below is an image of this strap suspension system from the company's 1979 catalog. 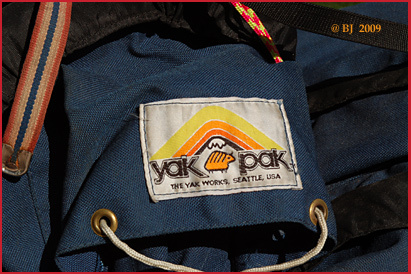 Don continues, "The Yak Pak is the product that launched The Yak Works, and was always YW's signature product, but was small potatoes in terms of sales. "YW's manufacturing activity mostly involved a line of Gore-Tex clothing made from patterns drawn by two designers who teamed up with, then were employed by, YW. In larger terms, YW evolved into primarily a retailer of merchandise manufactured by other companies, and while manufacturing accounted for most of the three dozen or so jobs at YW, the great majority of the revenue was from resale merchandise." (images of YW goretex clothing and the "Terra Therma Slip-in Sleep System" may be posted at a later date). YAK WORKS SLEEPING BAG: Below is a lesser-known Yak Works innovation. This effort came late in Yak Works' career, featuring a melding of several materials and designs. The basic concept was the eternal one of creating "a better bag." The catalog picture is from their 1984 catalog. The concept was focused on a better bag for the typically wet and fairly mild challenges of backcountry travel in the Pacific Northwest. Starting from the ground, the designers threw away the wastefulness of sleeping on top of a layer of compressed down in favor of using one of the new-fangled Thermarest pads. Thus, like Stephenson's Warmlite Triple Bags had always been doing, the ground insulation was made an integral part of the bag, such that the sleeper could not roll off of it. Cascades Designs made a custom-shaped version of their standard pad for Yak Works. The bag itself was constructed of standard nylons, and the insulation chosen for the damp Northwest was a synthetic named QUALLOFILL. 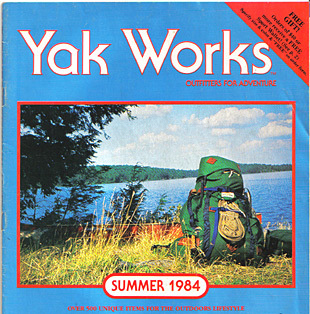 The Yak Works stayed in business somewhat over ten years and annual sales reached over one million dollars at the highest. ..But Wittenberger says the company he helped begin "never turned a profit," and was, sadly, in the end, a sinkhole for his partner's substantial investment. Don left Yak Works in 1981, and became involved in rescuing the patterns and vital production assets of another outdoor gear company, Rivendell Mountain Works, from disappearing forever. Main Page: Essays and pictures about the Pioneers of the Outdoor Gear Revolution, 1935-The Present. 45+ pages, five History of Gear books published, and ever-expanding!